There was a time when organ fabrication was the stuff of science fiction. Now, as with many science fiction concepts, fiction has become fact: Living human organs are being constructed in the lab. Human skin was one of the first tissues successfully grown in a laboratory, and it is now routinely used in the treatment of serious burns. By early 2006, the first urinary bladder grown in a laboratory from a patient’s own cells had been successfully transplanted. 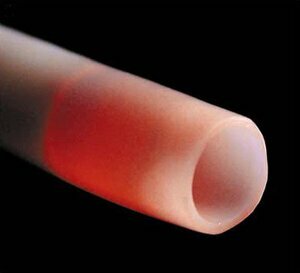 Now, artificial blood vessels can be added to that list of success stories, and may soon be ready for use by doctors. One of the major problems with engineered artificial organs has been finding a way to supply the newly-transplanted living tissues with the fluids, nutrients and oxygen that normally would flow through capillaries. That problem has been solved by a team of scientists at the Fraunhofer Institute in Germany. Using 3D printing technology and a process called multi-photon polymerization, they have been able to use printers, similar to the ink jet printers most people have in their homes, to make artificial blood vessels. These vessels will be used during the transplantation process with other lab-created human organs. The technology will be on display for the first time this October at the Biotechnica Fair held in Germany. 3D printing techniques are already being applied to many different industries. The same technology that allows an ink jet printer to form words, can be used to generate three-dimensional objects with a wide variety of different materials. This process is already used in the creation of clothing, airplane parts, the construction of architectural models and, sometime, even for making chocolate candies. Creating workable blood vessels, however, has proven to be a much more complex problem than making candy. To replace blood vessels, the material that was being shaped by the printers had to be highly flexible and, at the same time, had to be something that the human body would not reject. Scientists solved the problem of flexibility by combining two different kinds of technology. They used the 3D printing techniques along with a process called two-photon polymerization. Polymerization is the process of directing an intense laser beam in brief pulses at a material, driving the molecules that form it into a very small focus point so that the molecules become cross-linked. This cross-linking makes the material extremely elastic. With this elastic material, scientists were able to make tiny, highly-detailed structures that would interact with normal human tissues. In other words, they are able to make the capillaries that are so essential to the artificial-organ transplant process. The second problem, organ rejection, was solved by coating the walls of the manufactured blood vessels with a microscopic layer of bio-molecules such as anchor peptides and heparin. This allows living body cells to anchor themselves into the structure of the artificial blood vessels. With its own cells lining the vessels, the body is fooled into accepting them as its own tissue and will not reject them. Scientists have also developed a hybrid material that eliminates the need to line the newly formed vessels. This material contains both the elastic, synthetic polymers and the bio-molecules mixed together. This is then used as the “ink in the 3D printers to form the vessels. Dr. Gunter Tovar is the head of the team working on the artificial blood vessel project at the Fraunhofer Institute for Interfacial Engineering and Biotechnology IGB in Stuttgart, Germany. He states, “The individual techniques are already functioning and they are presently working in the test phase; the prototype for the combined system is being built.” He believes that his project will show the world what possibilities exist in the realm of organ fabrication. “The vascular systems, says Dr. Gunter, “ illustrate very dramatically what opportunities this technology has to offer, but that’s definitely not the only thing possible Making blood vessels, it seems, is not the end of this new technology, it’s just the beginning.